During the 80’s Oren played regularly with Loose Tubes, London Brass, the Jazz Warriors, Microgroove and Mervyn Africa. Oren has also travelled extensively, especially in Africa, collaborating with the Pan African Orchestra, the Ghana Dance Ensemble, Kakatsitsi, Rasha, Abdelkadur Saadoun as well as with Chandru from India and Afro-shock from Italy. 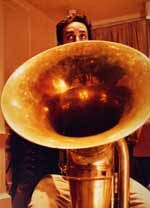 In March 2001, Oren was part of Chris Batchelor and Steve Buckley’s quintet ‘Big Air’ along with drummer Jim Black and pianist Myra Melford and has collaborated with such free improv alumni as Derek Bailey, Steve Noble and Keith Tippet as well as Paul Dunmall, Davey Williams, Dave Wickens, Franz Hautzinger, Mark Sanders, Paul Rutherford and Adam Brett. Oren has been twice nominated for a BBC innovation in Jazz award (2002, 2003) as well as being asked to take part in ‘unlikely duets’ with Steve Buckly. “One of the best performances to be heard in Hong Kong for some time”.